27 years, 4 months, 14 days old age. Karun Nair will turn 28 on 06 December, 2019. Only 7 months, 15 days, 21 hours, 44 minutes has left for his next birthday. Karun Nair has celebrated the total number of 27 birthdays till date. See the analysis by days count and bar graph. 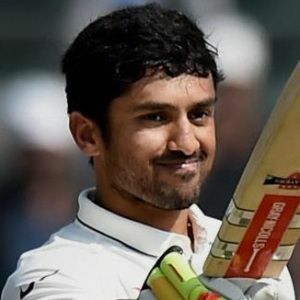 Karun Nair was born on 06-12-1991 in Jodhpur in the state of Rajasthan, India. He is an Indian Cricket Player. Karun Nair is an international Indian cricketer. He is a right-handed batsman and off-break bowler. Earlier, the IPL has played for Royal Challengers Bangalore and Rajasthan Royals. Karun Nair completed his studies from the Frank Anthony Public School in Bangalore. Karuna Nayar's mother, Prema Nair, is a teacher from the profession who teaches at a school in Bangalore. He had started playing cricket since he was 10 years old. Karun Nair played some 5 years of first-class cricket and given his good performance, he was included in the Ranji team of Karnataka. Initially, he used to play for his school team, where his talent was soon recognized. Making them easy to reach state-level cricket. During this time, he also played for Karnataka Under-15 and Karnataka Under-19, where he got an opportunity to share the batting experience with the best national level players while playing with different teams. In 2013-14, he was first played in Karnataka and the Ranji Trophy was awarded. Karun Nair got the chance to play in IPL team Royal Challengers Bangalore in 2013. This IPL season proved to be good for them to learn something from the big players and retain their performances. Which they got in the Ranji season of 2014-15. In this season, he scored 709 runs and in the final match, he scored 328 runs. Due to his excellent performance, Karnataka could win the Ranji title after 15 years. Overall, having lived with Rajasthan Royals for two years, he has become an international player, who is always professional with his performance. On June 11, 2016, Karun Nayar played his first international ODI against Zimbabwe at Harare Sports Club. And he debuted in the Test Cricket in 2016 against England. After this Nayar played against England in Mohali. In this series, he made his first century in the last match and converted it into an unbeaten 303. This performance of this spectacular batting made history. With this triple century, Karun Nair made Test Cricket's first fastest triple century, which has become a history. He became the second Indian player to score a triple century after Virender Sehwag. He has been a consistent figure at the IPL. He has played for Royal Challengers Bangalore, Rajasthan Royals, and Delhi Capitals in the past and is currently playing for Kings XI Punjab. He was born to Kaladharan Nair and Prema Nair. He has a sister named Shruti Nair. He became the third batsman of the world to Turn the first century into a triple century. In 2013-14, he made his debut from Karnataka in the Ranji Trophy. For the 2016 IPL season, he bought by Delhi Daredevils at a huge amount of Rs 4 crore, while their base price was only 10 lakhs. He debuted in the Test Cricket in 2016 against England.